Malaybalay – The landlocked province of Bukidnon located at the southern part of the Philippines is known as the highland paradise at the heart of Mindanao. It is the region’s main source of agricultural products, particularly rice, corn, coffee, pineapple, and sugar. Hence, Bukidnon is known as the region’s “food basket.” Its panoramic landscape of rolling grassland plateaus as well as its cool climate makes it an ideal place for locals and tourists alike. Deep in the region’s highland between the boundary of Davao and Bukidnon, the Matigsalug tribe flourished. This tribe is a distinct sub-group of the indigenous people known as the Manobos. They are the original inhabitants of the Salug River (now called the Davao River). Thus, their name comes from the words matig, meaning “from,” and salug, meaning “river.” Over the years, the tribe moved upstream of the Salug River due to constant raids and harassment. They were pushed further inland because of the influx of various groups, such as the Ilocanos, Batangueños, Ilonggos, and Cebuanos in the area. The Matigsalug are known for their skills in hunting and gathering, though they subsequently shifted to farming due to the influence of the migrant farmers from the Northern Philippines. Around 50,000 Matigsalug inhabit the Tigwa-Salug Valley in San Fernando, an area certified by the Philippine government as their ancestral domain. They are mostly small in stature with dark brown complexion and curly hair. Although their traditional lifestyle has not been preserved, much of it is still evident in their cultural and artistic expression. Their colorful costumes, songs, and dances demonstrate the tribe’s previous way of life. According to oral tradition, the tribe originated from the river, as most of their houses were built next to it. Indeed, the river became the main source of food for the majority of the Matigsalug because of its abundant fish and the edible plants that grow along the riverbanks. The water was used for drinking, bathing, and washing. The river sustained the Matigsalug, especially during periods of drought. In recent years, however, the influx of people together with the increase of population in the area eventually contaminated the river. Moreover, trees are fewer due to the constant cutting by illegal loggers. These factors left few options for the Matigsalug to survive and made them more vigilant in taking actions to defend and preserve the river from abusers. Today, the tribal community is committed to protecting and preserving the river. Although farming has become their main source of livelihood, the tribes have taken plenty of measures to care for their habitat and have planted more trees to support the riverbanks. A famous Matigsalug ritual called panubad is performed for protection and to appease the spirit living in the water. The same act is carried out along with an offering of blood acquired from a white chicken when someone falls sick after visiting the river. As a harmonious tribe, the Matigsalugs shy away from conflicts and instead form good relationships with the other tribes in the region. The Kaamulan Festival is an annual gathering of the seven hill tribes of Bukidnon. It is held to unite and celebrate the unique indigenous culture of each tribe that originally inhabited the region. 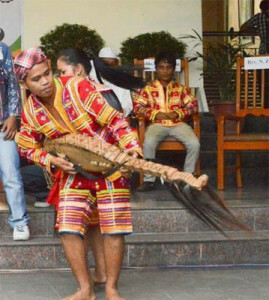 During the months of February and March in Malaybalay City, the Bukidnon, Higaonon, Manobo, Talaandig, Matigsalug, Umayamnon, and Tigwahanon tribes show off their colorful attires and showcase their authentic rituals that have endured through the years.